How Much Does it Cost to Repair a Furnace in 2019? The last thing any homeowner wants to wake up to is a cold house; especially in the northern states where no furnace means a lot of unhappy family members, and possibly frozen pipes. Then, the next thing you start thinking about is can it get repaired? And, how much will it cost? 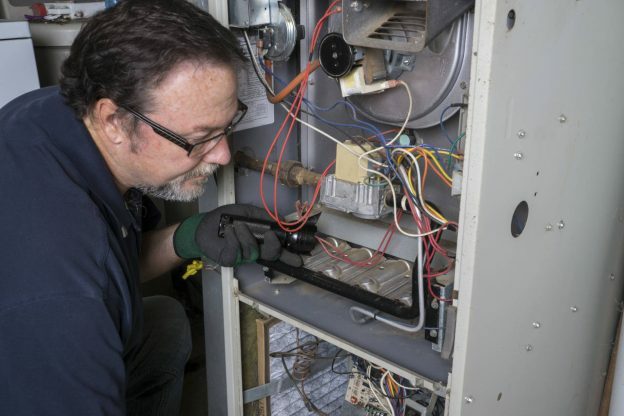 The national average to fix a furnace is $285, and most spend between $175 and $400. Of course, there are numerous variables, such as the type of furnace and what part malfunctioned. Many times, the repair part costs more than the labor to replace it. Frequently, especially with electric furnaces, the repair is much less than a replacement heater. Whether to repair or replace will most often depend on the age of the broken furnace and the part broken. Furnaces usually last around 15-20 years. However, some poorly built machines that get continuous use throughout the winter could wear out sooner, and once these reach the end of their lifespan, they tend to need more thorough maintenance or have recurring problems. The price of replacing an old furnace with a new furnace depends on the fuel it burns. In most cases though, a new furnace costs between $2,000 to $5,000. The cost of repairing your home furnace will depend mainly on its brand and model. The electric furnace is usually less expensive to repair than fuel-burning units because these units are typically smaller with less parts. As the coils inside the heating element get hot, air blows across them sending warm air through the heat ducts to every room in the house. Routinely, when something goes wrong with an electric furnace, it has something to do with the heating coils or its elements. Natural gas and propane gas are basically the same as far as repairs go. The significant difference is that propane is liquefied petroleum gas (LPG) and is generally tank fed, whereas natural gas, what some refer to as “city gas” gets metered and piped into your home’s furnace. With a propane furnace, the first thing you should check when you wake up to a cold house is if there’s fuel in the tank. It might seem obvious, but checking could save you a service call charge. Other common issues for both are malfunctioning gas valves, heat exchangers, or flame sensors. Typically, repairs cost anywhere from $100 to $1,200. Heat pumps transfer hot or cold air, depending on the outside temperature. When it’s warm outside, the unit is usually attached to an air conditioner and transfers cool air into the house through ducts and when it’s cold, the unit transfer heat to warm the home. Depending on the specific problem, such as a control board or thermostat, it could cost $300 – $600. Boilers heat water and send it throughout your home with pipes, often attached to radiators. Mineral deposits clog pipes, pilot lights malfunction or break, and radiators leak or malfunction causing them to lose heat. These problems typically cost between $200 and $600, but the actual cost can only get determined by locating the exact problem. Common furnace repairs and the average price. Whatever your heat source, a forced air system depends on the blower to move the heat from the source throughout the house. When the blower motor goes, so does your heat. Igniters are the same as a pilot light in some systems. It makes a spark to ignite the gas after being notified by the thermostat the temperature is at or below the setting. The heat exchanger is similar to an oven in the furnace where the air gets heated, the harmful gases removed, and then blown through the ducts to heat the house. Flame sensors are safety switches in your furnace. It’s a small rod that has the function to ensure the gas valve only opens when there is a flame present to burn the gas. Often, what is wrong has nothing to do with your furnace at all, but the temperature regulator known as the thermostat. Many things can go wrong with that clever little gadget, and when one does, your temperature will not stay constant. The gas valve is what turns on or off to send gas into the burner with either propane or natural gas furnaces. When you need furnace repairs, let us help you find a qualified heating professional near you.